We are excited that you purchased one of our Swipe Meal Plans for the 2018-19 school year! 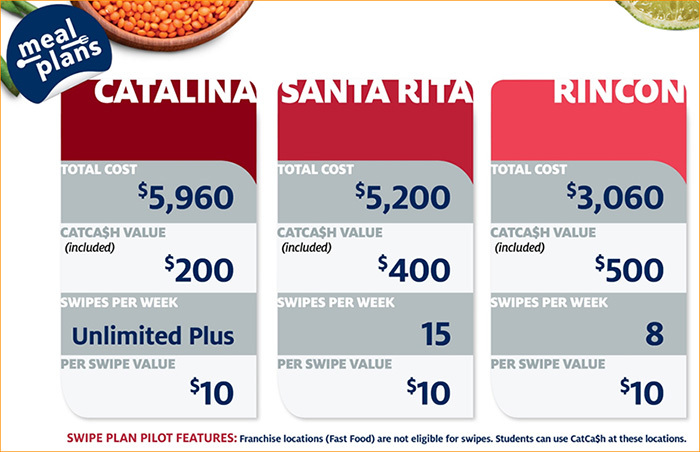 You and your Swipe Plan peers will be the first to experience the newest meal plans at the University of Arizona, created specifically to support your health and nutrition while eating on campus. Everything you need to use and get the most from you Swipe Plan will be posted here, so be sure to check back often! Your Swipe Plan offers a variety of delicious AND nutritious options from over 20 dining locations on campus! Use the links below to find each location and explore the swipe menus designed just for you!